In July 1913, over 7,000 miners struck the C&H Copper Mining Company in Calumet, Michigan. Six months without work left many miner families with little food for the holidays and no money for presents, so the Ladies' Auxiliary of the Western Federation of Miners held a Christmas party for the kids. 500 children and 200 adults showed up that day, Christmas Eve 1913. It was held on the second floor of Calumet's Italian Hall; the only way in and out was a very steep stairway. As darkness fell and people began to go home to their family celebrations, some of the children gathered around the stage as presents were passed out — for many, it would be the only gift they'd receive this year. In the middle of this festive celebration, a man wearing a badge labelled "Citizens Alliance": an anti-strike group organised by employers opened the door at the bottom of the staircase and yelled, “FIRE!" Chaos ensued. As everybody headed down the stairs to the exit, the door was blocked from the outside, and children and adults were trampled, then suffocated, by the throng of bodies trying to escape the “fire" — which didn't actually exist. 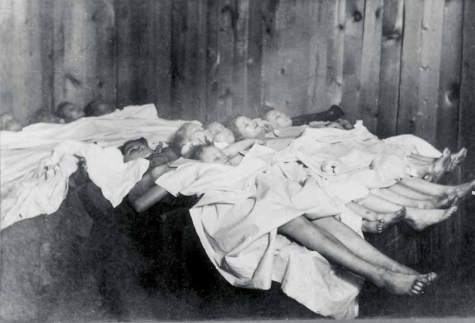 Children on the bottom of the pile suffocated from the weight of the bodies piled atop them and people struggling to escape stepped on those who had fallen. A woman who realized she was going to die lifted her baby over her head. The baby was found alive, clutched in his dead mother’s hands. In all, 73 people, including 59 children, died, most of them Finnish migrants. The youngest was Rafael Lesar, 2.5 years old. The oldest was Kate Pitteri, 66 years old. Some families lost all of their children, like Frank and Josepa Klarich, who buried their three daughters, Kristina (11), Maria (9), and Katarina (7). Their little crosses are lined up in a row over their graves in a cemetery west of Calumet. The culprits who yelled into the hall that day to start the tragedy were never identified, but it is widely suspected that it was allies of mine management or the owners who did so to disrupt the miners' party. Nobody was ever prosecuted or even arrested for causing the massacre. It is always thus: Those with money and power control the narrative, silence the truth, and thwart justice. Partly because a lot of miners left Calumet behind after this tragedy, the strike didn't achieve its demands. However, it was considered a turning point for union strength in Michigan's Copper Country. In 1941, Woody Guthrie got an idea for a song about the tragedy, which he called “1913 Massacre." That the copper boss' thug men are milling outside. One of them yelled and he screamed, "there's a fire,"
A lady she hollered, "there's no such a thing. "It's just the thugs and the scabs fooling you,"
Edited together from When 59 Children Died On Christmas Eve 1913, The World Cried With The Town Of Calumet, Michigan and The Michigan Bar Journal.